Paul Rudd is an American actor, who has gained world popularity due to the role of Mike Hannigan in the popular TV series Friends. At present, the fans know Rudd on his role of the superhero of the Ant-Man in the range of the movies of Marvel universe. Today, we will disclose his all facts including his career, upcoming movies and so on. What is Paul Rudd Famous for? An American actor, comedian, screenwriter, television producer, and film producer. His roles in the movies Clueless, The 40 Year Ols Virgin, Anchorman, I Love You, Man and The Perks of Being a Wallflower. What ethnicity is Paul Rudd? Paul Rudd was born in Passaic, New Jersey, the U.S. His full name is Paul Stephen Rudd. His nickname is Fred. Name of his father is Michael Rudd whereas the name of his mother is Gloria. He has one sibling named Julie Rudd. He was raised in Kansas. Both of his parents are from Jewish Families. His nationality is American. His ethnicity is Caucasian-White. He has been to Broadmoor Junior High School and later to Shawnee Mission West High School. After his graduation, he joined the American Academy of Dramatic Arts/West located in Los Angeles. When dis Paul Rudd pursue his acting career? Talking about his career, his first film was as Jimmy in Runaway Daughters in 1994. It was a TV film. His first television appearance was in the NBC drama Sisters from 1992 to 1995 in which he played the role of Kirby Quimby Philby in 20 episodes. He portrayed the recurring role as Bobby Newport on the television series Parks and Recreation from 2012 to 2015. He was nominated for a Saturn Award in 2016 for Ant-Man and been nominated for multiple MTV movie and TV awards as well as a Screen actors guild Award. He made an appearance for big movies like The Legend of Ron Burgundy, The 40-Year-Old Virgin, Knocked Up, Forgetting Sarah Marshall, I Love You, Man, Dinner for Schmucks, Our Idiot Brother, The Perks of Being a Wallflower and This is 40. He was awarded a star on the Hollywood Walk of Fame in 2015. Rudd was officially confirmed as cast in the 2015 Marvel film Ant-Man. He played lead character Scott Lang/Ant-Man, and also co-wrote the screenplay with Adam McKay. Rudd reprised his role in Captain America: Civil War (2016) as well as Ant-Man's 2018 sequel, Ant-Man, and the Wasp; he also co-wrote the latter. Rudd will return alongside Evangeline Lilly in Avengers: Endgame (2019). Who is married to Paul Rudd? Paul is a married man. He got married to Julie Yaeger in 2003. Before getting married, they have had relations for more than five years. In 2006 Julie gave birth to their son Jack, and in 2010 their daughter Darby was born. The actor’s family has settled in Manhattan. He is more often in Los Angeles because of the hard busy movie-making schedule. The actor is so busy in the shootings. Other information related to his affairs, past relationships is not revealed. In the case of revealed, we will let you know. How much is Paul Rudd worth? 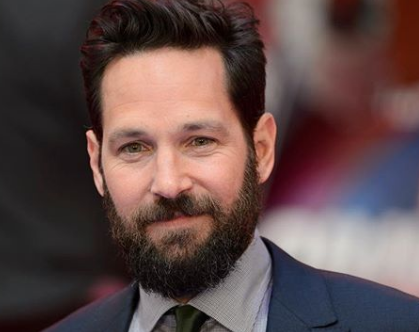 Summing up all of his earning from his films and TV roles, Paul Rudd has the estimated net worth of $30 Million. This includes all his assets as well as earning from his endorsements. However, his salary was not disclosed yet. In the case of disclosed, we will let you know. Observing her body statistics, Paul Rudd has a perfect height of 5 feet 10 inches (1.78 m) and the body weighs 77 kg. His eye is green and hair is Dark Brown in color. His other body information was not disclosed yet, In the case of disclosed, we will let you know. In 1998: He began filming on a movie called "Chicken Blood and Other Tales", but production was canceled before it wrapped. Hw was classmates with Matthew Lillard at the American Academy of Dramatic Arts. He auditioned for the role of Jack Dawson in Titanic (1997) as his father had been an avid Titanic historian. During his audition, Rudd was able to rattle off various facts about the ship.